An agency assuring goods at half their price has reportedly cheated hundreds of people of the area by collecting huge amounts of money from them and then fleeing. There is a sense of relief at the PAU as its efforts to create awareness and educate farmers not to go in for early transplant of paddy have yielded dividends. The Additional Sessions Judge, Mr A.K. Mehta, today dismissed the anticipatory bail applications moved by three girls studying in Panjab University, Chandigarh, allegedly involved in the Sarabha Nagar firing incident. A teenager allegedly committed suicide in New Kailash Nagar this afternoon by hanging herself from a pipe in the roof. The state government’s move not to recruit ex-servicemen below the rank of Lieutenant Colonel as Deputy Director Sainik Welfare (DDSW), is making ex-servicemen see red as they claim that commissioned officers who retire as Captain and Majors are being discriminated against. The supply of safe drinking water, proper disposal of human excreta, good food hygiene and good personal hygiene were the four essential ways of prevention and control of waterborne deceases, advocated the authorities in Sangrur district Health Department. It is no longer the time for artistes to remain in segregated airtight chambers in a particular medium. Rather it is time for integrated media for them. For anybody who is familiar with her character of Prerna in Star soap “Kasauti Zindagi Ke”, it will be difficult to believe that Shweta Tiwari is a girl next door — just out of college, witty and bubbly. The All-India conference of Marxist Communist Party of India (United) is being organised in Chandigarh from September 17-20, the arrangements for which have already been initiated by the party all over India. Residents of Naya Mohalla, opposite Alfa Tower here, have been moving from pillar to post for past so many months seeking to stop the loud music played in a nearby hotel till late in the night. Mini bus and autorickshaw operators held a protest rally against hike in fuel prices here yesterday. A large number of operators from Jodhan, Raikot, Mullanpur, Jagraon and Samrala participated in the rally. Ramu Bihari is alleged to have stolen a wallet containing Rs 1500 belonging to Balbir Krishan Bansal of Nehru Market, Jagraon. The local police has registered a case under Sections 458 and 380 of the IPC. Export of wool and wool blended textiles and readymade garments including knitwear, increased to Rs 2,098.27 crore during 2005-06 in comparison to Rs 1,874.06 crore in the previous year, registering an increase of 11.96 per cent. Scooter parts traders and manufacturers have condemned the imposition of excise duty on the suppliers or packers of automobile components. At the initiative of the Bureau of Indian Standards (BIS), PAU’s College of Agricultural Engineering arranged a meeting between manufacturers of harvest combines and scientists of the Department of Farm Power and Machinery for a brain-storming session on “test code” for these machines here today. 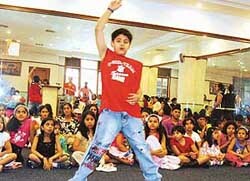 The Class X result of Shri Guru Harkrishan Public School has been declared as 100 per cent. A group on nine B.Tech (agri engg) students of the College of Agricultural Engineering, Punjab Agricultural University, returned from Moscow yesterday. They had gone to Moscow State University of Environmental Engineering for attending a two-week practical training programme from May 28 to June 11. ‘Surface Ornamentation’- Sportking Institute of Fashion Technology (SIFT) has organised a seven-day free workshop at the summer camp in the Sutlej club here. 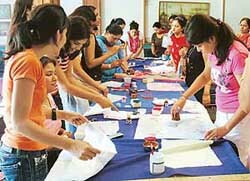 Training is being imparted to visitors interested in learning fabric painting at the workshop. Campus interview for MBA students were conducted at PTU Learning Centre, here yesterday. The interviews were held for placing MBA students at various management positions in ICICI Bank. A general body meeting of activists of the All-India Sikh Student Federation (AISSF) of Fatehgarh Sahib district was held at Gurdwara Nanaksar Sahib, here today. It was presided over by AISSF chief Ujjal Didar Singh. At the meeting, members of the district executive of the party were elected. “Summer Camp-2006” concluded at BCM Dugri here on Monday. Punjab Agricultural University has signed agreements of cooperation with the University of California, Davis, and the University of Florida to enhance academic interchange and to further the development of basic scientific and technological research and faculty-student exchange programmes. 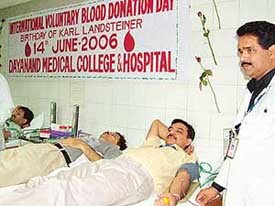 To commemorate the birth anniversary of Karl Landsteiner, the father of transfusion medicine, who is credited with the discovery of the ABO and Rh blood group system in the year 1900, the International Blood Donor’s Day was observed today by the department of Transfusion Medicine of Dayanand Medical College and Hospital (DMCH). A free medical and dental check-up camp was organised by Christian Medical College and Hospital (CMCH) at Rania village in this district yesterday. More than 400 patients were examined in the camp and medicines were given free of cost. The Revised National Tuberculosis Control Programme (RNTCP) aims to make ‘Directly Observed Treatment Short Course’ (DOTS) the standard of care for TB patients in all medical colleges and hospitals attached to them. Medical colleges play a critical role in TB control in terms of the sheer number of patients they treat. The Ludhiana District Badminton Association has decided to organise the summer camp here at the Shastri hall in the Guru Nanak Sports Complex from June 15 to 25, according to Mr Anupam Kumaria, honorary secretary of the association. The inaugural match of the 5th Friendship Cricket Cup Tournament for school boys (u-19 years) to be organised by the Sunrise Cricket Club here at Government Model Senior Secondary School, PAU Jeewan Model Senior Secondary School ground from June 15 to 17 will be played between the teams of Jeewan Model Senior Secondary School and SAN Jain Model Senior Secondary School.